App of the day is a must have application if you are an Android user. This application will show you an application or game per day which you can get a paid application for Free, or get the Pro features of a free application for free (which you will have to pay otherwise). Earlier the application was available only for the United States and United Kingdom users only (We were using it by installing using APK). Now you can get this application from the play store easily and get paid application or paid features of an application for free everyday. 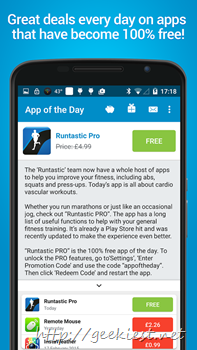 App of the Day gives you a paid app for free every day! Free apps come with all premium features unlocked for you – No more obstacles in the way of your enjoyment! Everyday check the application to see what is the offer, if you are interested grab the application for free and Enjoy.